Napoli have confirmed that Algeria international Faouzi Ghoulam tore his anterior cruciate ligament during the defeat to Manchester City. 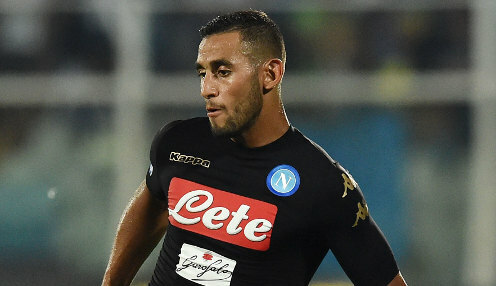 Ghoulam sustained the injury in the first half at the San Paolo as the Serie A side suffered a 4-2 Champions League loss to Pep Guardiola's team. He will undergo an operation to repair the damage on Friday and is expected to be sidelined until April. Head coach Maurizio Sarri thought Ghoulam's injury contributed to his side's defeat, saying: "In my view, we lost momentum with Ghoulam's injury as it took a while to re-organise and it becomes difficult to win back possession when they press you that high up the field. "We ran into a great team and caused them huge problems. "I am sad that we conceded on those counter-attacks, as we had the ball, but causing City so many problems is something to be proud of." The defeat was Napoli’s third in four Champions League group matches this season and they are six points behind second-placed Shakhtar Donetsk. Napoli are 1/1 to qualify for the last-16 of the Champions League and 50/1 to win the Serie A title outright this season.